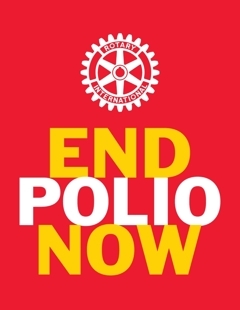 You can help End Polio Now by making a contribution. Click the "Donate" button for a secure payment. Rotarians, all contributions can be credited to your Foundation account. M any of us know someone who had a brush with the crippling disease which mainly strikes children. But Rotarian Doug Oberman of Cedar Falls has a very personal experience. Doug was a normally active boy until one day when he was eight. Polio robbed him of the use of his hands and arms, but not his spirit. Although Doug has slept in an iron lung for over 50 years, he graduated from college and law school and had a successful law practice for 29 years. In 2002 Rotary asked Doug to travel to Barcellona, Spain to address its international convention. 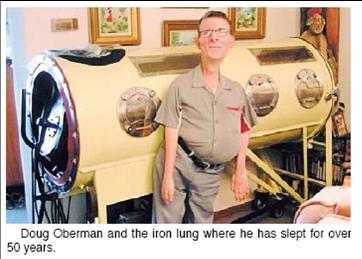 Although the ordeal of getting his iron lung onto the place was replayed four times, he made it and was the hit of the event. Later he traveled to Rotary meetings in Cleveland and Windsor, Canada where he gave powerful presentations about his passion for making polio only the second disease ever eradicated.